The demand for one-piece pools is growing year on year in the UK as the concept becomes more widely understood. Today’s portfolio of one-piece pool options is as broad as it is long. Production enhancements combined with high quality materials, customisable options, luxury finishes and extended warranties have led to a swell in the one-piece pools market – and the trend looks set to continue. “The pool trade are more interested in one-piece pools than ever before,” comments Ed West, Managing Director of Sunquest Pools. “The profile of one-piece pools has been raised considerably in the last few years, mainly within the consumer market, but it’s now the trade that are really seeing the benefits. “One-piece pools are generally easier and much quicker to install than concrete or liner pools, so the trade can benefit from more turnover with minimal input,” he adds. Buckinghamshire-based Sunquest Pools have recently teamed up with newly formed, to deliver a brand new one-piece exercise pool to the UK market. The Slipstream was launched at SPATEX this year and combines three important components, which make it stand out from the crowd. Firstly, the built-in Hydrostar turbine gives optimal performance of 160m3 per hour up to 430m3 hr, which means the pool suits a range of swimmers from amateurs up to professional triathletes or even iron man training. Secondly, the designers tapped into the British yacht and boat building industry when designing the GRP pool shell, resulting in a first class finish that is strong, highly durable and will last for many years. Finally, the integrated Ocea pool cover, within the Slipstream sits in specially designed GRP case that doubles as a seating area and shallow step, and offers insulation or solar heating depending on the type of cover selected. Alan Thorne, Managing Director of Ocea UK comments: “The reaction to the Slipstream by the pool trade has been very enthusiastic. They seem to like the overall package of a finished onepiece exercise pool that can be delivered complete onsite. The concept of one-piece pools is fairly straightforward; they offer high aesthetics on a short build time with minimal labour required. From a consumer perspective, one-piece pools are sold off-the-peg from a price list, which allows the customer to customise their pool at the click of a button. Customers are able to browse the range and choose their pool, which is delivered complete and installed within a couple of weeks from start to finish. For the trade, one-piece pools offer a quick installation and a controllable profit margin. The systemised one-piece installation is fast, straightforward and can be done in almost all weather conditions, therefore limiting the number of costly factors that can ultimately affect the profit margin. The one-piece Luxe Pool stands out for its strength and durability. Manufactured within a 15,000 square metre factory using more than 100 tons of resin every month, are designed to cater for extreme temperature changes found in northern Europe, Scandinavian and Russian climates. With over 15 different models to choose from, Luxe offer the perfect choice for indoor or outdoor swimming pools. Luxe also offer a carbon steel frame support system for above ground pool installations. 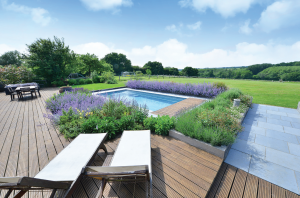 In addition to the GRP range, Luxe Pools also offer a onepiece fully tiled pool, the Tilestone, available as a skimmer, overflow or infinity edge type pool. 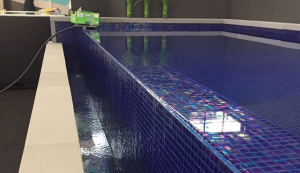 A unique manufacturing process ensures 100% leak-free pool structure prior to tiling. All Tilestone pools are fully insulated with a thermal conductivity of 0.25 W / m²k. 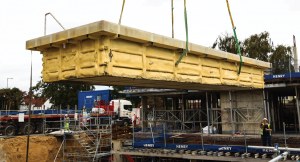 The self-supporting 100mm carbon steel box frame enables the pool to be installed above or below ground, ideal for roof-top installations or basements. Sectional pool structures are also available.